Certified Emergency Auto Escape Card Window Breaker with Recessed Seat Belt Cutter. Made in USA! Get 2 or 4 Pack & SAVE!!! + Free Shipping! Shatter Your Car window in a SNAP! We Reinvented the Hammer! And it’s 5X More Powerful than Out dated Spring loaded Device! Life Saving! When your life is on the line, don’t rely on inferior old fashioned alternatives. Consider the facts before purchasing your escape tool. OWL® Open Window for Life is superior because it does not rely on your strength to break the window. You don’t have to be strong for it to work and unlike spring loaded devices of yesterday, Owl Open Window for Life works with out moving parts, no chance of misfire. 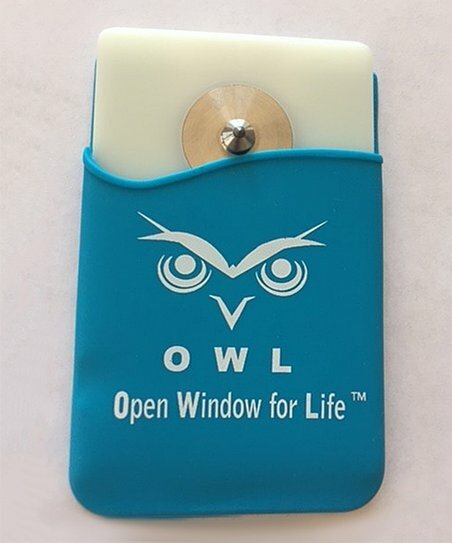 Owl Open Window for Life’s flat credit card size makes it portable to carry with you when traveling, car sharing as well as discreetly storing on your car visor. 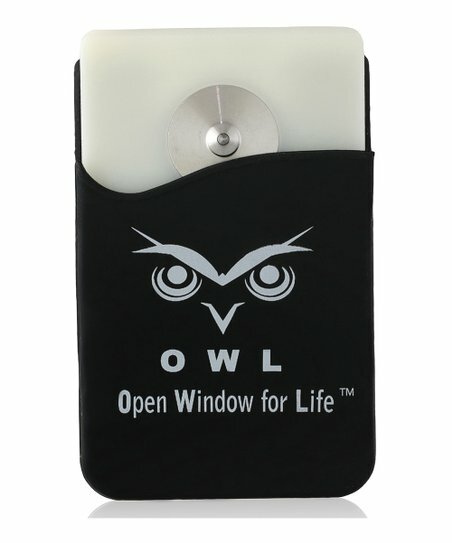 Owl Open Window for Life is made in America for quality control; with superior components and has been tested and certified by Bureau Veritas. 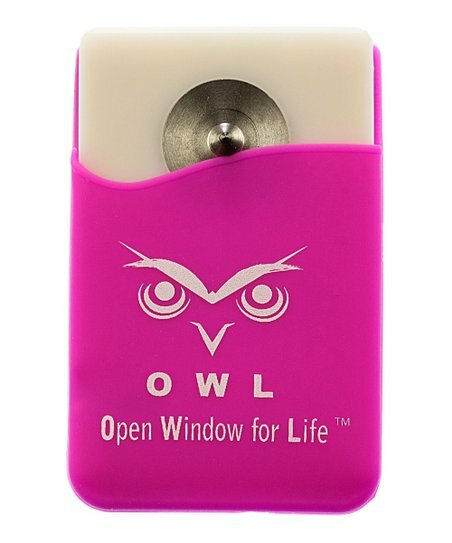 Sold around the world, used by Emergency Personnel , the US National Guard and drivers and travelers everywhere, Owl Open Window for Life is the smartest escape tool designed for today’s life style. Why buy from Clear Charity? Each 2 pack you purchase from our site donates estimated 120 Diapers for #DiaperAid programs! Slice your seat belt with the recessed cutter in a downward motion. Insert OWL® into the upper or side window channel as far as it goes. Arrow should be up, point side facing glass. Pull the bottom of the card toward you and release. The OWL® card breaks the glass outward. Push the remaining window glass out and exit your car. Why do I need Owl Open Window for Life? Everyone should have an escape tool , window breaker and seat belt cutter readily available in their vehicle in case of an emergency situation. Your escape tool should be within the recommended reach of 8 to 12 inches from you. OWL® is flat and credit card size so it is readily available to reach in a panic situation. It works differently than hammers or spring loaded devices. There is no pounding, no need for strength. It is more powerful than the spring devices and because it has no moving parts OWL ® cannot malfunction. OWL ® card shatters the glass outward, away from you. OWL® has a recessed blade that does not need a cover, it is handy for quick use in order to slice through your jammed seat belt. OWL® is the best gift you can give to yourself and everyone you love. How do I use OWL®? We recommend you keep OWL® on your visor or adhered to your cell phone. OWL’s® integrated razor blade cuts through nylon safety belts easily. 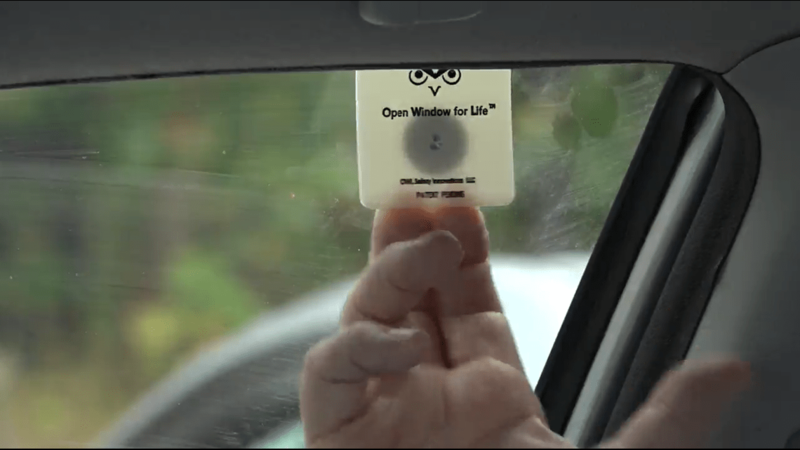 To break window, place the top of OWL® card , with the point towards glass, in the upper window channel, as far as it goes, with two fingers, flick the bottom of the card towards you and release. The OWL® card breaks glass outward. Push the remaining broken window out and escape to safety. 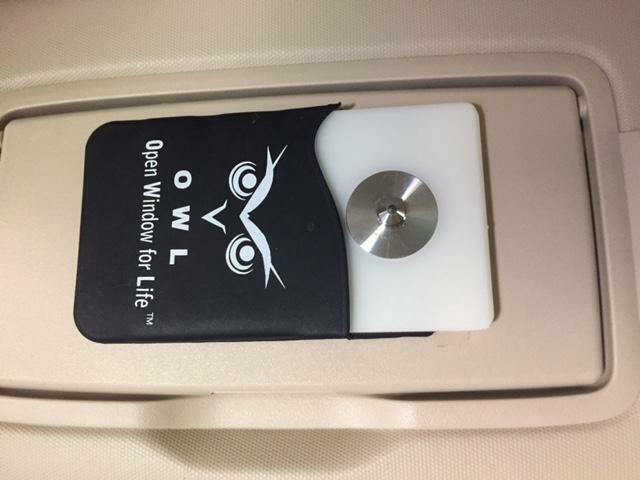 Will OWL® fit in the window channel of my car? 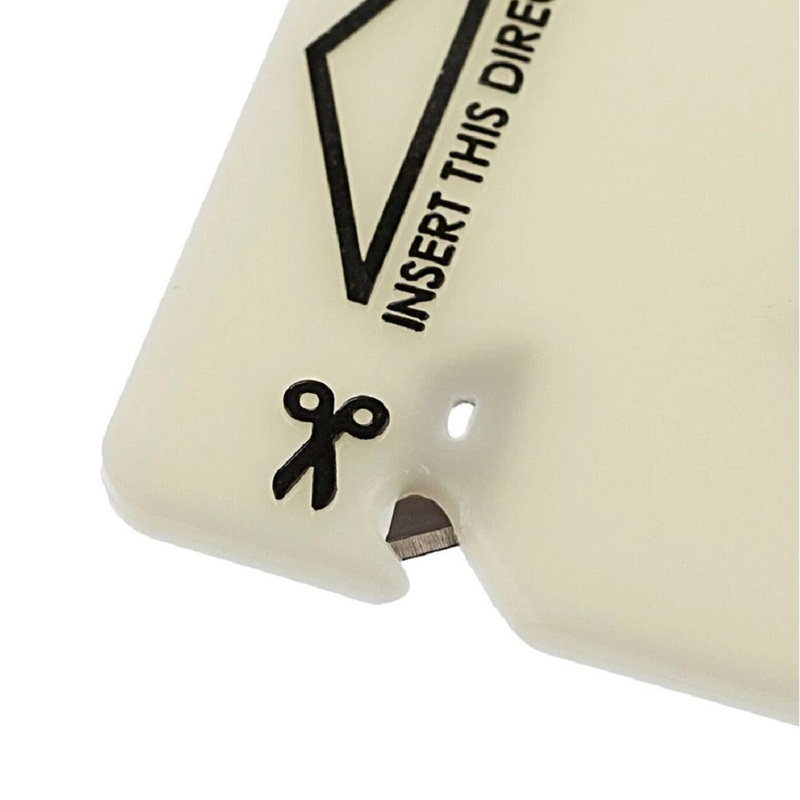 OWL ® has a beveled edge and fits right in the top edge or side edge. It has been tested on all types of cars , imported and domestic. OWL® has been tested by Bureau Veritas. What if my side window is open a bit, will OWL® still work? Use the same way as if it were placed in top of window channel. 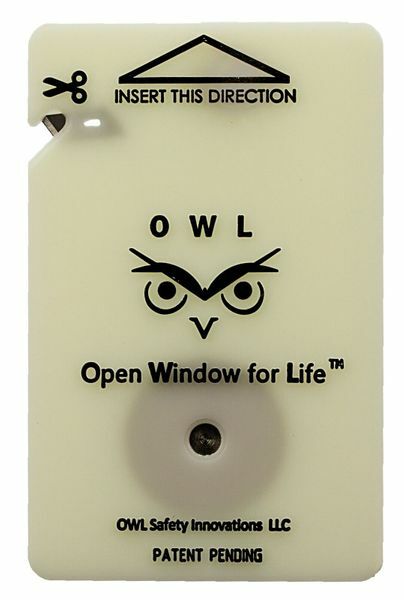 Insert OWL® in the side channel of your window, pull back and release. We provide several videos on this site and our utube channel demonstrating both ways. Does OWL® work on wind shields? No. OWL® is designed to shatter tempered safety glass windows. Does OWL® work on laminated glass? OWL® works on tempered glass. There are no escape tools that can break through laminated glass and have proof to support the claim, that’s because Lam glass has plastic in between two sheets of glass. OWL® shatters tempered and tinted glass windows. We provide videos and 3rd party testing to demonstrate OWL®’s ability to shatter windows. To find out what type of window glass your car has look for the sticker on the lower corner of the window. Can OWL ® be used more than one time? Yes, OWL® is built to be used more than one time, it is manufactured with superior grade materials and can be used over and over. OWL® precision stainless steel blade belt cutter can also be used multiple times. If OWL® has no springs, how does it work? OWL® does not have springs or any moving parts. The flat card acts as one big spring and and is designed to break glass outward with the snap of your finger.What is the OWL® Holder made of? The holder is made of flexible silicone with 3M adhesive backing. We recommend that you leave about a half inch of space at the bottom of the silicone holder, this will make it easy to grab and pull out of holder. Make sure sticky strip and your visor surface are clean (no greasy film) for best stick results.The holder has 2 small slices on the upper sides is it supposed to? Yes, this is intentional. 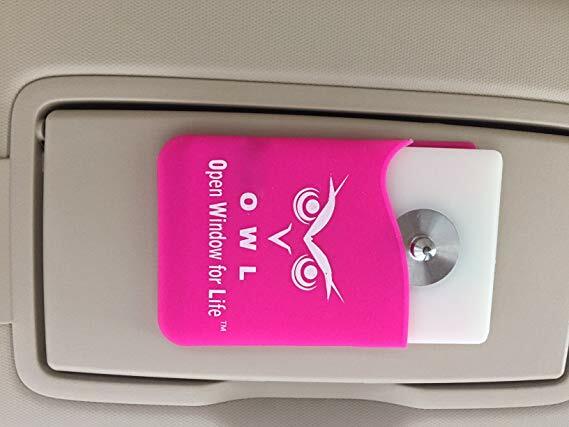 There are two small slices on both sides of the silicone holder, this loosens the air tight seal a bit for easy removal, yet it is still tight enough to keep OWL® secure on your visor.Can OWL® break windows from outside the car? Yes. OWL® breaks tempered glass. 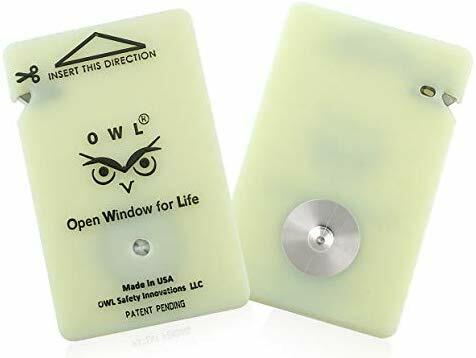 It does work on outside of window by holding the card up to the window and striking the card, (point side facing glass) , the OWL® card will shatter the glass. OWL® escape tool is designed for emergency use only. OWL® is designed to break safety glass from inside the car by using the inner window channel to provide an escape to outside the car. OWL® is capable of breaking the glass from the outside of the car in a different manner. 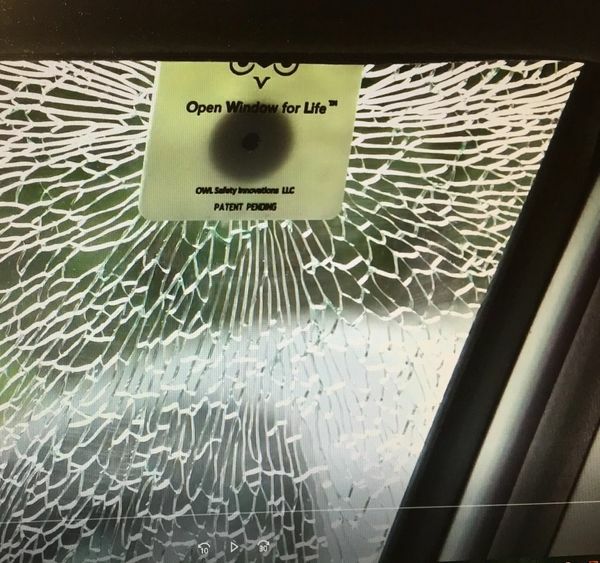 We are not responsible for any inappropriate usage of device such as theft, personal injury, property damage of any kind, or any other consequence arising from the improper use of OWL® Open Window for Life. Please visit our HOW to USE instruction page. Do not drop OWL® device on glass counters or tables. Do not store without silicone holder covering metal tip next to glass objects such as your cell phone. OWL® can be tested , it will work repeatedly. Do not test on any glass that you do not want broken. Keep out of reach of children. ​OWL® device is fully guaranteed. 100% money back if not satisfied. Return Policy: Proof of purchase must be provided. Return address : 960 Post Oak Close, Alpharetta, GA 30004. Unauthorized dealers are not covered by our warranty. Purchasing from unauthorized dealers could result in obtaining copies, fakes, stolen and sub-standard devices, and therefore not guaranteed. We take your safety very seriously and work exclusively with dealers and resellers we trust with our product.